This CD really bridges the channel between two European cultural hubs at the turn of the century. It shows the close interrelations between the music from the beginning of the 20th century in both Paris and London. With the pieces arranged mostly in chronological order, the development from the turn of the century through the Great War up to the roaring twenties is made very tangible. Many of the composers featured on this recording have an Anglo-French background as well. André Messager, for instance, was a French composer and conductor who worked as administrator at Covent Garden between 1901 and 1907. The ensemble Frivolités Parisiennes aim at introducing modern audiences to the rich heritage of French musical frivolities by raising awareness of the Parisian repertoire of 19th century opera-comique, opera bouffe and operetta through chanson, dance, music, comedy and interaction with the audience. This way, they not only try to bring back to life forgotten pieces, but the lifestyle that accompanied them – a very venerable pursuit indeed! Extending this approach to English songs works astonishingly well, even if a less frivolous approach has been taken for the songs dating from the time of WWI, especially for the lovely bilingual version of Roses of Picardy. 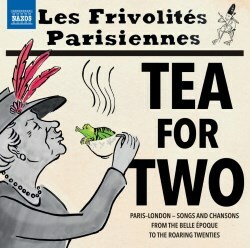 The CD’s title Tea for Two does – of course – not only relate to the first piece of music on this record but to the Anglo-French musical interrelation encountered here. Frivolités Parisiennes are joined by Chloé Ducray, who studied the harp at the Conservatoire National Supérieur in Paris. She founded her own ensemble Octalys, which won the second prize at the European chamber Music competition in 2010. So far, she has recorded one CD with compositions by Schubert and Schumann, and performed with the Opéra National de Paris, the Orchestre National de France amongst others. Her playing adds a very special touch to this recording. The baritone Philippe Brocard, who won the first prize in the international Operetta competition in Marseille in 2013, as well as the audience award and the honour prize of the city of Marseille, is a real gain for this CD. However, especially noteworthy is the soprano Clémentine Decouture, who in her rendering brings back to live and memory the spirit of times long gone with an, occasionally, quite cheeky and frivolous tone. She holds the Diplôme National Supérieur Professionnel du Musicien of the Conservatoire de Paris and Boulogne-Billancourt. Over the last years she has won many prizes, amongst others three prizes at the Concours International d’Opérette in 2014 and Le Grand Prix Opéra in the following year. The overall quality of the recording is very good. The somewhat brief booklet notes come – obviously – in French and English. With Tea for Two, an unusual cornucopia awaits the listener, far from a mere walk down a dusty memory lane. This CD is very enjoyable and refreshing, and I am glad it introduced me to Frivolités Parisiennes and their interesting projects.